The Plunkett Institute provides comprehensive leadership and development programmes to members. There are 3 entry level programmes, supplemented by a Continuing Professional Development Programme. ICOS and Plunkett Institute training is delivered by the ICOS Skillnet. Level 1 Training Programmes are designed to provide aspiring leaders with a basic understanding of their industry, an introduction to the Co-operative Structure, and an appreciation for the process of developing strategies for sustainable business. 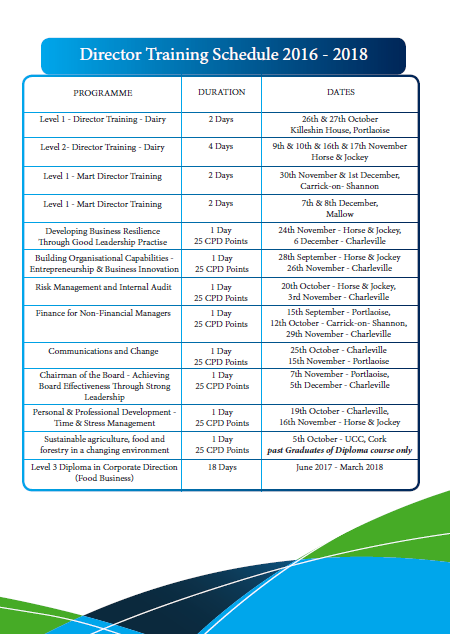 The programmes, delivered by ICOS, in partnership with individual Co-ops and Macra na Feirme, are typically delivered over two or more days, and feature entry level modules on Leadership, Strategy, Finance, Co-op Structures, Agricultural Policy, and Marketing. These programmes satisfy the training entry requirements to the Affiliate membership Tier. Level 2 Training programmes build on already learned leadership skills and industry experience, and help to prepare Directors and aspiring Directors to embrace their roles and leaders and strategists. The programmes delivered by ICOS, in partnership with affiliate Co-operatives, and employing the skills of industry and training professionals, are typically of 4 or more days duration, and feature more detailed modules on Co-op Finance, Communications, Co-ops and the Law, the Role of Officers, International Marketing etc. These programmes satisfy the training entry requirement for all tiers up to Full Membership. The Institute currently recognises one level 3 Training programme, the ICOS UCC Diploma in Corporate Direction (Food Business), although the Board will consider other appropriate professional training programmes for recognition. The ICOS UCC Diploma, typically delivered over 8-two day modules, across an academic year, challenges students and develops their leadership skills across a range of Professional Disciplines. This qualification satisfies the training entry requirement for all membership tiers. Plunkett Institute Members commit to participate in Continuing Professional Development, through engaging in formal training, attendance at approved Events and Seminars, and developing their governance skills on their own Boards and Sub Committees. Find out more about CPD here.